You've spent hours together: late night sitcom binges, getting lost on road trips, looking through your old photos ... Your phone is practically your best friend. Now you can invite your phone to parties too instead of always leaving it out of the fun. 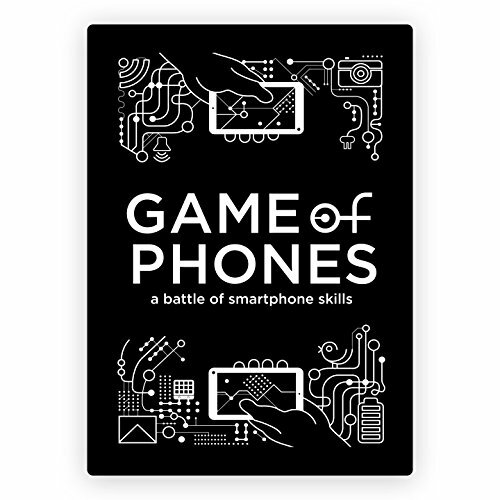 Get to know your friends and their BFFs (i. e. their phones) with Game of Phones, the card game that puts your internetin' skills and jam packed photoroll to good use. It's like a scavenger hunt on your phone! Each round you and your pals take turns judging each other on your googling abilities, photo snapping prowess, social clout and much more. While you and your smartphone win the "Find your best selfie" round with that pic you took while SCUBA diving last summer, your buddy across the table picked up the card for "Create an emoji masterpiece." Your relationship with your phone will finally be rewarded when you bring home the trophy for Game of Phones (trophy not included but DIY attempts encouraged). Use your phone as the ultimate gaming partner. Find the weirdest and bestest things on your phone to win. Show off old photos & fresh ones too. A great game for big or small groups. 2nd edition (two part box).